...you'll see white men cheat black men everyday of your life, but let me tell you something and don't you forget it, whenever a white man does that to a black man that white man is Trash! Aunt Stephanie Crawford: There's a maniac lives there and he's dangerous...I was standing in my yard one day when his Mama come out yelling, 'He's killin' us all.' Turned out that Boo was sitting in the living room cutting up the paper for his scrapbook, and when his daddy come by, he reached over with his scissors, stabbed him in his leg, pulled them out, and went right on cutting the paper. They wanted to send him to an asylum, but his daddy said no Radley was going to any asylum. So they locked him up in the basement of the courthouse till he nearly died of the damp, and his daddy brought him back home. There he is to this day, sittin' over there with his scissors...Lord knows what he's doin' or thinkin'. Bob Ewell: [to Atticus] I'm real sorry they picked you to defend that **** that raped my Mayella. I don't know why I didn't kill him myself instead of goin' to the sheriff. That would have saved you and the sheriff and the taxpayers lots of trouble...What kind of a man are you? You got chillun of your own. Calpurnia: That boy is your company. And if he wants to eat up that tablecloth, you let him, you hear? And if you can't act fit to eat like folks, you can just set here and eat in the kitchen. Rev. Sykes: Miss Jean Louise, stand up, your father's passin'. Atticus: Do you know what a compromise is? Atticus: Uh, no. It's an agreement reached by mutual consent. Now, here's the way it works. You concede the necessity of goin' to school, we'll keep right on readin' the same every night, just as we always have. Is that a bargain? Narrator: There just didn't seem to be anyone or anything Atticus couldn't explain. Though it wasn't a talent that would arouse the admiration of any of our friends, Jem and I had to admit he was very good at that, but that was all he was good at, we thought. 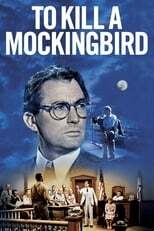 Atticus: Do you want to tell us what really happened? Mayella: I got somethin' to say. And then I ain't gonna say no more. He took advantage of me. An' if you fine, fancy gentlemen ain't gonna do nothin' about it, then you're just a bunch of lousy, yella, stinkin' cowards, the - the whole bunch of ya, and your fancy airs don't come to nothin'. Your Ma'am'in' and your Miss Mayellarin' - it don't come to nothin', Mr. Finch, not...no. Atticus: Good Afternoon Miss Dubose... My, you look like a picture this afternoon. Scout: [hiding behind Atticus whispering to Jem and Dill] He don't say a picture of what. Atticus: It'll have to come before the County Court. Of course, it's a clear-cut case of self-defense. Sheriff Tate: Mr. Finch, do you think Jem killed Bob Ewell? Is that what you think? Your boy never stabbed him. Dill: I'm Charles Baker Harris. I can read. I can read anything you've got. Folks call me Dill. Jem: Well no wonder then. Scout's bin readin' since she was born, and she's not even six yet. You're mighty puny for nearly seven. Dill: I'm little but I'm old. Gilmer: How come you're so all-fired anxious to do that woman's chores? Gilmer: With Mr. Ewell and seven children on the place? You did all this choppin' and work out of sheer goodness, boy? Ha, ha. You're a mighty good fella, it seems. Did all that for not one penny. Gilmer: You felt sorry for her? A white woman? You felt sorry for her? Dill: I wonder what he does in there? I wonder what he looks like? Scout: Atticus, do you defend ****s? Atticus: Don't say '****,' Scout. Scout: I didn't say it...Cecil Jacobs did. That's why I had to fight him. Atticus: Scout, I don't want you fightin'! Atticus: I don't care what the reasons are. I forbid you to fight. There are some things that you're not old enough to understand just yet. There's been some high talk around town to the effect that I shouldn't do much about defending this man. Scout: If you shouldn't be defending him, then why are you doing it? Atticus: For a number of reasons. The main one is that if I didn't, I couldn't hold my head up in town. I couldn't even tell you or Jem not to do somethin' again. You're gonna hear some ugly talk about this in school. But I want you to promise me one thing...that you won't get into fights over it, no matter what they say to you. Atticus: Scout. I told you and Jem to leave those poor people alone. I want you to stay away from their house and stop tormentin' them. Atticus: Well, I think that's all the reading for tonight, honey. It's gettin' late. Scout: May I see your watch? [reading] 'To Atticus, My Beloved Husband.' Atticus, Jem says this watch is gonna belong to him some day. Atticus: Well, I don't know that I have much else of value that belongs to me. But there's a pearl necklace - and there's a ring that belonged to your mother. And I've put them away and they're to be yours.